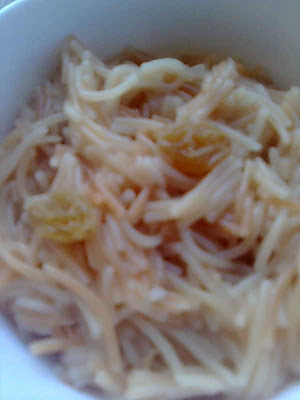 This Indian vermicelli dessert is really fast to cook and will keep your sweet tooth satisfied. Sweet sevai is very easy to make and since this recipe is made without milk unlike sevai kheer, it’s ok for people with lactose intolerance. I don’t use much ghee to cook it (keeping calories in mind) but you can do that if you want to make it rich. Heat ghee in a pan and roast cashew pieces in it till golden. Take them out of the pan and keep aside. Now roast vermicelli in the same pan without adding any more ghee. Roast them on medium heat stirring all the time, till golden. Add water and cook covered. Stir occasionally. When about ½ cup water remains in the pan, add sugar, cashew nuts and raisins. Cook uncovered, mixing it till all water gets evaporated. Turn off heat and serve sweet sevai hot.